This revised and updated edition of the best-selling guide to building log homes is now bigger and better than ever. It takes you through the complete process of building a log home, and makes it easy with the clear instruction and countless diagrams. It also provides practical advice and tips on building and contracting your log home: getting started, choosing an architect, construction skills and tools, scheduling and controlling costs, and much more. It also features many valuable appendices which include a sample schedule, cost summary sheet, daily site report, and much more. 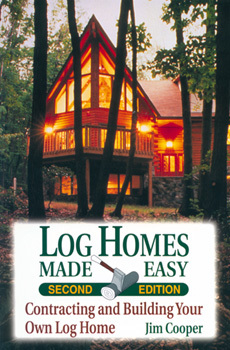 If you dream to one day live in a beautiful log home, this book is highly recommended to get you started.